A near-destitute boxing trainer thinks he’s found title-fight material in a young scrapper. "For convinced auteurists, Jacques Prévert comes as something of a stumbling block. 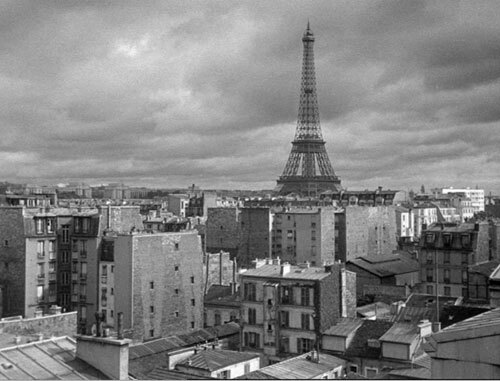 With Prévert as scriptwriter, Marcel Carné directed several supreme classics of French cinema; when the two split up, Carné sank into obscure mediocrity. A bas Carné, then, cold and formal craftsman helplessly limited by his material, and vive Prévert, true begetter of Le Jour se lève and Les Enfants du paradis? And yet—if Prévert scripted Carné's greatest successes, he also wrote Les Portes de la nuit, the disastrous postwar flop from which neither of their careers ever recovered. And if Carné minus Prévert looks flat and uninspired, Prévert's scripts for other directors—with one or two exceptions—rarely attained the level of his best work with Carné." So writes the distinguished critic Philip Kemp. One might be tempted to make comparisons between other writer-director teams whose collaborations did not quite last through the whole of their careers. Michael Powell and Emeric Pressburger, maybe. 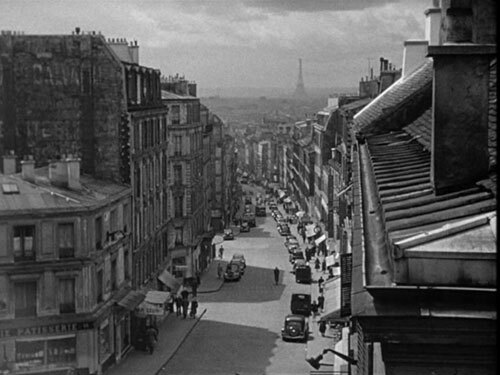 But the fall off in quality isn't nearly so precipitous as what you've got in the Carné-Prevert case. So what, then, have we here, in this 1954 drama, directed by Carné from a script by himself and Jacques Sigurd? Not Enfants nor Quai des brumes not Drole de drame to be damn sure, but a thoroughly banal tale of a near-destitute boxing trainer who thinks he's found title-fight material in a young scrapper, only to have his late-career dreams of glory dashed through the disapproval of his wife and the scrapper's ill-advised jones for a society dame. What could be more tiresome, indeed? Then again, there is an intriguing "twilight of the gods" vibe running through the misbegotten film, thanks to the fact that the trainer and his mostly loving but not-quite-there-for-him-in-the-clinch wife are played by Jean Gabin and Arletty, respectively. Gabin was, of course, an icon of French cinema both popular and artistic in the vital years of the '30s, starring in Pepe le moko, Grand Illusion, La bete humaine (both by Renoir), not to mention Carne's own Le jour se leve and Quai des brumes, to name but a few. Less than a decade prior to this film, a slimmer, more ethereal Arletty beguiled Jean-Louis Barrault in Les enfants du paradis, and she was of course Gabin's passionate leading lady in Le jour se leve. While the screen association of these two was not as close as that of the Hollywood couple, L'air de Paris can nonetheless be seen to these two stars as Guess Who's Coming To Dinner is to Spencer Tracy and Katherine Hepburn. 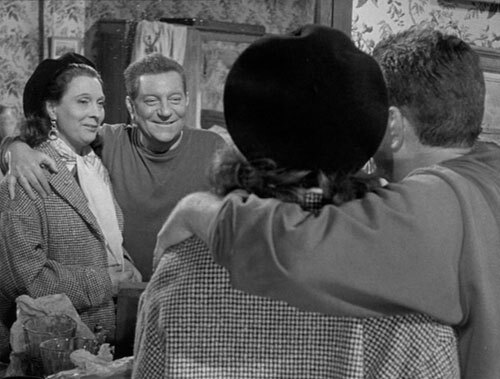 The self-consciousness inherent in the late pairing of Gabin and Arletty is acknowledged early on, as the older, heavier, but nevertheless happy to be together couple regard themselves in a mirror, and Carné, no doubt yearning for glories past, fixes his camera on them with adoration and perhaps supplication: maybe these two, in the absence of Prevert, can bring the magic back. No dice, alas. While Carné's direction is professionally fluid and brisk, the storyline is one ill-considered cliché after another, and the worst of it is, the picture doesn't even live up to its title. 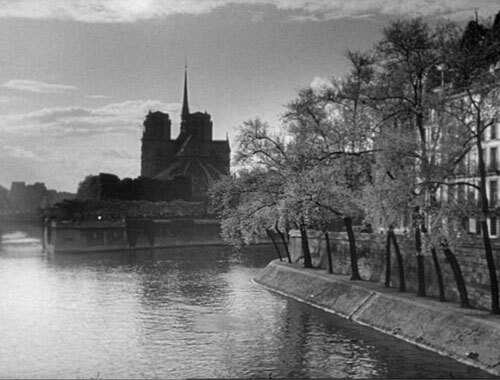 For Carné, evoking "the air of Paris" only means cutting to a nicely framed shot of a particular city landmark and lurking there for a bit. 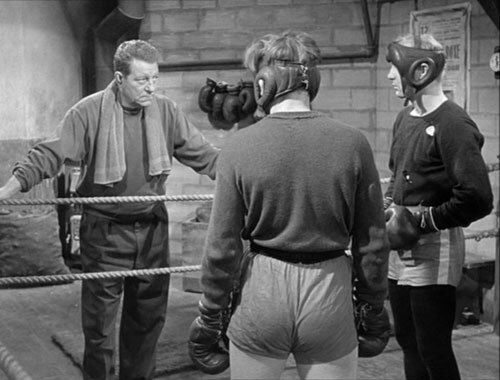 Then, it's just a matter of cutting to some set-bound silliness in which Gabin's character tries to set his protegé (played by Roland Lesaffre, just off a small part in Carné's rather more considered Zola adaptation Thérese Raquin) on the right path for a boxer, which, surprise, means no high-class dames. Okay then. And when that fails, it's back to another atmospheric shot. Man, how awesome are those flying buttresses on the back of Notre Dame, huh? Definitely makes me want to visit again. I'd be thirty dollars closer to doing so had I not gotten this Region 2 U.K. Optimum DVD, which, despite its very good picture quality, is recommended only to the most devoted Carné completist. I’d say to the esteemed Mr Kemp that Les Portes de la Nuit, the last completed Prevert-Carne collaboration, is a masterpiece to rank alongside their other work together, although I’m in a minority on that. Carne’s late-period fantasy, La Mervelleuse Visite, is equal parts embarrassing and sublime. Not boring, anyway. I think what Carne lacked in his later work was a consistent writer, which all narrative filmmakers need. You’re right to compare him to Powell, who had some writing talent but not enough story genius to score consistent success without Pressburger. Last night I watched about 40 minutes of Carne’s Les Assassins de l’Ordre (wasn’t able to finish, alas) and I didn’t think it was bad at all. It wasn’t Quai des Brumes but it was lovely to look at and pretty good. I think you may be correct about the writing in late Carne though; what struck me as the primary flaw was somewhat wooden dialogue. It’s time for us all to speak up for late Carne. I, for one, will gladly vouch for Three Rooms in Manhattan — not quite Simenon, not quite Melville (though he wanted to make a film based on the novel pretty badly), but definitely Carne.